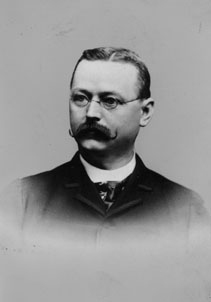 Anthon, Professor Charles Edward (1822-1883), member ANS, editor of the American Journal of Numismatics, cataloger for Edward Cogan beginning in May, 1870, with the John Allan collection. He was born in New York City in 1823, the son of a Charles Anthon (1797-1867) L.L.D., a lawyer and classicist. In January 1834 his father published Bibliotheca Classica, or the Classical Dictionary, when he was Jay Professor of the Greek and Latin Languages and of Archaeology and Ancient Geography and Rector of the Grammar School in Columbia College, New York. Charles Junior graduated from Columbia College in the class of 1839 at age sixteen. After some years spent studying abroad in Europe, he returned to the United Sates and accepted the position of chair of history at St. John's College in Annapolis, Maryland. In 1852, he was appointed professor of history and belles-lettres at the New York Free Academy (now the College of the City of New York) and remained in this position until shortly before his death in 1883. He received an honorary degree of Master of the Arts by Columbia University in 1853, and received a Doctorate of Laws from the University of the City of New York in 1866. While there he was curator of the coin collection of the Free College of the City of New York. In 1865, he became a coin collector and began studying numismatics. He became a member of the American Numismatic Society, then known as the American Numismatic and Archaeological Society, in December of 1866 and was nominated as President of the Society in 1868. He would remain as the Society's president until his death in 1883, except for a three year period from 1870-73. In 1867 he won some coins at the Mickley Sale. A noted scholar of numismatics he was particularly known for his work on medallic art and the Gloriam Regni coins of the Franco-American colonies. He was an avid numismatist having a five-sectioned coin cabinet for which he wrote a list with prices intended to be published in five bound volumes. However, he died on June 7, 1883 in Bremen, Germany, where he had gone to recuperate from an extended illness. His obituary is published in American Journal of Numismatics, July 1883, pp. 22-23. As an officer of the ANS, he also played an important role in continuing and expanding the Society's publications program through his work as editor of the American Journal of Numismatics. He maintained the scholarly integrity of the journal, and increased the length and frequency of this publication at a time when others were in support of changing its content to meet the concerns of collectors, and in favor of limiting the number of volumes issued each year. After the first three November sales by Bangs and Company in 1882 never completing the fifth list. This last list was drawn up by George Cogan when Bangs completed the last two sales in May and October, 1884. Crosby, Sylvester Sage, The Early Coins of America; and the laws governing their issue. Comprising also descriptions of the Washington pieces, the Anglo-American tokens, many pieces of unknown origin, of the seventeenth and eighteenth centuries, and the first patterns of the United States mint. By Sylvester S. Crosby. (Boston, 1875). Listed as a subscriber.